Looking back over my last few reviews I realised I’d been focussing purely on films produced in the 21st century. This was not intentional but was something that needed to be addressed. With this in mind I have hatched a plan. Using some gaffer tape, a lemon and two sheep I have invented a time machine powered by knock knock jokes that will convey me through a whistle stop tour of a century of Great War Films. Starting before the end of the Great War with my first film ‘Civilization’, I’ll then pick a film from each decade and proceed through the history of cinema. You, of course, are invited to join me. Before I crack into the film I feel I should make an admission…..I struggle slightly with Silent films. Some more than others, I must admit, but to a lesser or greater extent I find them hard to concentrate on or understand. There’s probably large and important elements of these films that just go whoosh straight over my head without me even knowing about it. I also think a lack of historical and sociological context holds me back. I am no expert on the social mores and nuances of the zeitgeist of the era which means anything slightly allegorical or metaphorical or chronologically contextualised is lost on me. I need my storyline mushed up and spoon-fed to me by a giant doing the ‘here comes a train!’ bit. I wish this wasn’t the case and it’s something I’m trying to fix. I just need to watch more silent films and get into the ‘language’ of them. What I’ve come to realise is that it’s really important to pay close attention to any emotions on display and to read as much as I possibly can into what every inter-title might say about a character and their motives. I shan’t give up on them because when I feel like I get it (J’accuse 1918, being an example of a film I didn’t struggle with and Caligari, of course) I know I’ve found a film that I’ll love deeply until I die. 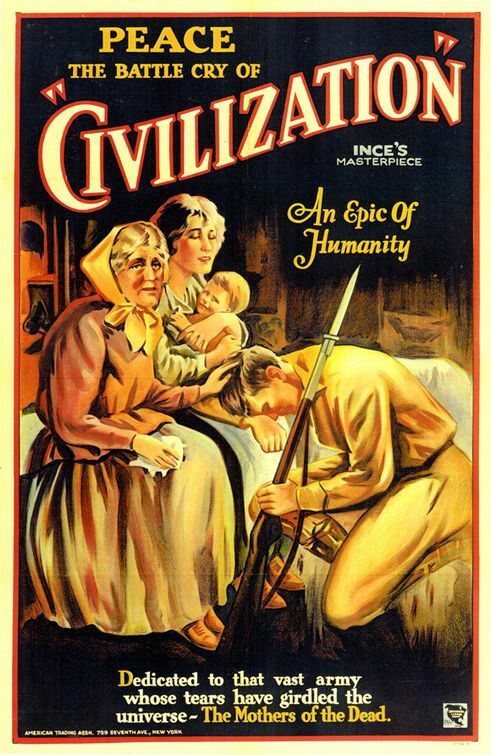 My film today ‘Civilization’ isn’t quite a proper Great War Film. It was produced and released while the Great War was still in progress and isn’t directly about the conflict but what it does do is mirror the conflict and laud a pacifist agenda. It’s rich with allegory (oh dear, going cross eyed) and confronts the important moral questions of the time. In other ways it’s stock standard Great War Film stuff. There are battle scenes, mounted charges, land/sea battles, there’s a sad cataract riddled old lady crying about something (I’m guessing it’s the loss of a generation rather than from chopping onions), there’s a nice leader who’s had to make some tough decisions and, of course, there are the poor downtrodden masses. ‘Civilization’ is mostly famous for being the first film to portray Jesus as a character. Good on them for pushing the boundaries and all that but what they’ve created, at least to my modern viewpoint, is a one trick pony of a film that could’ve been done and dusted in a reel, maybe two reels tops. It’s probably, at least in part, due to its age but this film feels very clunky. The pacifist stuff is laid on with a trowel. Jesus behaves like the Ghost of Christmas Past showing the warmongering king the error of his warmongering ways, the King, like Scrooge McDuck in a Pickelhaube sinks to his knees and begs for forgiveness. Another problem I have is that this was meant by all accounts to be a big budget spectacular with the equivalent of tens of millions of dollars in the purse. Where did it all go? The sets are shonky and small scale, the day rate extras are in their tens and the action is fleeting and scaled back. I just don’t get it. I actually checked if I was watching the right film. Ever done that? Read about a film and then been totally confused when what you’ve got in front of you is nothing like everyone else says? Sadly, it turned out I was watching the correct film. What did I like about it? Not much. 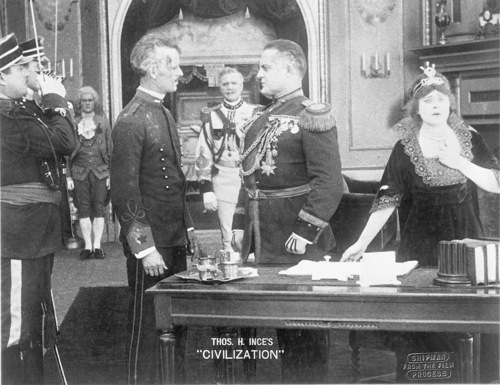 I like the way silent films in general make me feel a bit chin strokey and slightly superior to everyone else. I would’ve liked to have banged on about the rich social commentary and how it really shines a light on the …..etc. Bored now. ***Shoulders drop*** it’s just not for me. I tried to like it, but didn’t. So, in conclusion, this isn’t a very good film. Maybe it’s me, its age or whatever but as I see it, today, tonight, right here and now….it’s just a bit rubbish. 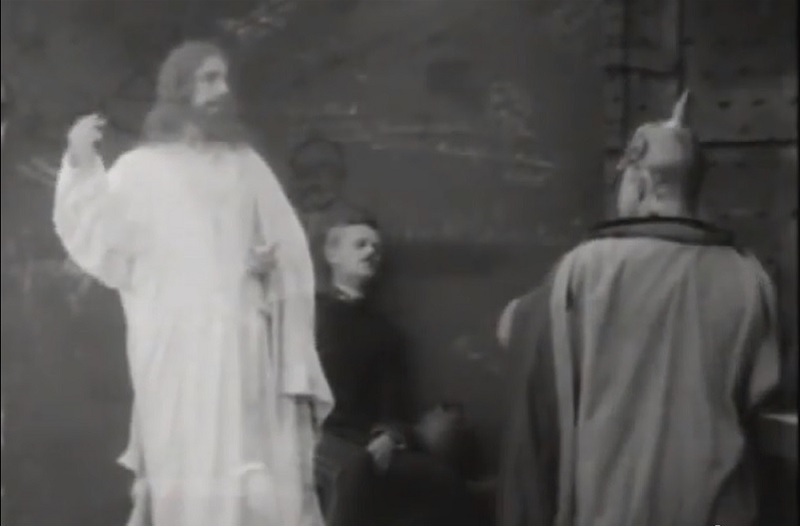 The pacifist stuff is well over the top, Jesus going all Ghost of Christmas Past hasn’t aged well. It also feels long and slow even though it’s only 86 minutes from start to finish. As I said I struggle with silent films at the best of times but when they’re also rubbish as well as hard to watch I’ve not got anything to hold my (famously short) attention span. In conclusion this is a film that would no doubt have been an amazing spectacle upon release but to my slightly milky 21st century eyes it’s just a bit rubbish. Maybe even more than a bit. So, on we go into the 1920’s. 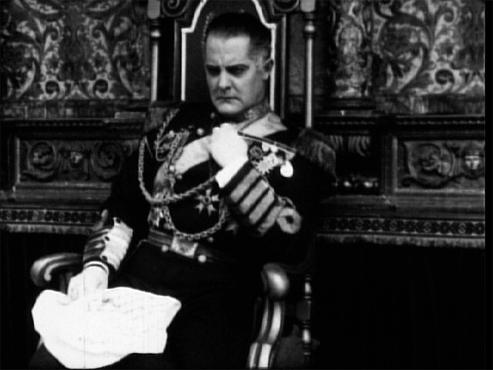 Next up for the Great War Film review treatment is…….’The Big Parade’ 1925. Clicky Clicky if you want to but it. I promise I won’t judge.